Clint Dempsey scored a hat-trick as Fulham stunned Newcastle in an extraordinary game at Craven Cottage. Danny Guthrie's emphatic strike put Newcastle ahead, before Danny Murphy's penalty kick-started Fulham's comeback. Dempsey bundled in his first and then finished off a blistering counter-attack before Bobby Zamora scored another penalty to make it 4-1. Hatem Ben Arfa's individual effort gave Newcastle hope but Dempsey secured the points with a fine run and finish. This remarkable match was always likely to hinge on how well Newcastle would cope without their Africa Cup of Nations stars - namely Cheick Tiote and Demba Ba - both of whom have been fundamental to the Magpies' successful campaign. And, judging by their superiority throughout the first 45 minutes, it was a test they seemed well equipped to handle. Ben Arfa, handed a start in the absence of Ba, featured on the right side of a front three that also contained Shola Ameobi and Leon Best, and the Frenchman was central to Newcastle's numerous first-half attacks. The Magpies should have gone ahead when Fabricio Coloccini waltzed into the box unmarked, but then only managed to stab his effort straight at keeper David Stockdale from point-blank range. It was a big miss that was forgotten moments later when Newcastle finally made their dominance count through Guthrie's long-range opener. After collecting a pass from Ben Arfa, who had robbed Bryan Ruiz of the ball in the Fulham half, Guthrie rifled a thunderous left-footed shot past the outstretched Stockdale - a strike that sent the travelling support at the Putney End of the stadium wild with delight. Fulham have won four of their last five Premier League matches at Craven Cottage, with four of those games against teams in the top seven of the table. The error summed up Fulham's abject first-half performance. But the home side were handed a lifeline at the start of the second half when former Magpie Damien Duff was clumsily shoved in the back by full-back Davide Santon as he ran on to a long ball. Santon, who was already on a yellow card, was lucky to escape further punishment before Murphy sent Dutch keeper Tim Krul the wrong way with the resulting penalty. The goal ignited Fulham and suddenly the west Londoners looked the more likely to get a second. Zamora was denied by Krul, who smothered the England striker's attempt, before Chris Baird lashed the rebound just over the bar. With Newcastle eager to re-establish their lead, they were found outnumbered at the back as substitute Andrew Johnson led a pacy counter-attack. With Zamora to his right, Johnson played in the England striker, whose shot was parried to Dempsey, who turned in from close range. Fulham were in the ascendancy, exposing Newcastle with every attack and the American soon put daylight between the sides with Fulham's third. Set free down the right by Zamora, Dempsey fired low into the bottom corner to make it 3-1. Newcastle were shell-shocked and had no answer to Fulham's second-half onslaught. The home side's incessant pressure meant a fourth goal was never far away - and it came courtesy of another penalty. Centre-back Mike Williamson was unable to stop Johnson driving into a shooting position before Krul brought down the former Crystal Palace striker. Like Santon earlier in the game, the Newcastle keeper was lucky to escape with a yellow card. But the real punishment came when Zamora, watched by England coach Fabio Capello, hammered the penalty down the middle. Ben Arfa closed the gap to two goals again when he cut in from the right and fired a low shot inside the near post. But the afternoon belonged to Fulham, and particularly Dempsey, who darted between Williamson and Coloccini to latch on to Murphy's long ball and fire in the first Premier League hat-trick by an American. 95:12 The referee brings the game to a close. 90:00+4:00 Free kick awarded for an unfair challenge on Davide Santon by Philippe Senderos. Strike on goal comes in from Ryan Taylor from the free kick. 90:00+1:37 The referee blows for offside against Bobby Zamora. Indirect free kick taken by Tim Krul. 90:00+0:40 Substitution (Fulham) makes a substitution, with Kerim Frei coming on for Clint Dempsey. 88:05 Bobby Zamora provided the assist for the goal. 88:05 GOAL - Clint Dempsey:Fulham 5 - 2 Newcastle Clint Dempsey finds the net with a goal from deep inside the penalty box to the bottom left corner of the goal. Fulham 5-2 Newcastle. Correction - 86:37 Jonas Gutierrez takes a shot. Shola Ameobi gets a block in. The assistant referee flags for offside against Andrew Johnson. Tim Krul takes the indirect free kick. 86:37 Jonas Gutierrez takes a shot. Shola Ameobi gets a block in. Andrew Johnson is flagged offside by the assistant referee. Tim Krul takes the indirect free kick. 85:31 Substitution Leon Best leaves the field to be replaced by Ryan Taylor. 84:20 GOAL - Hatem Ben Arfa:Fulham 4 - 2 Newcastle Hatem Ben Arfa grabs a goal from deep inside the penalty box to the bottom right corner of the goal. Fulham 4-2 Newcastle. 84:18 The assist for the goal came from Shola Ameobi. 83:33 James Perch gives away a free kick for an unfair challenge on Damien Duff. Danny Murphy restarts play with the free kick. 82:32 Tim Krul takes the indirect free kick. 82:32 Substitution Dan Gosling is brought on as a substitute for Yohan Cabaye. 82:32 The official flags Andrew Johnson offside. 81:55 Jonas Gutierrez takes the chance to get an effort at goal. Save made by David Stockdale. 78:20 The ball is delivered by Danny Simpson. 78:04 The ball is sent over by Hatem Ben Arfa, Philippe Senderos manages to make a clearance. 76:25 The official flags Andrew Johnson offside. Tim Krul restarts play with the free kick. 75:19 Substitution James Perch joins the action as a substitute, replacing Danny Guthrie. 74:50 Jonas Gutierrez challenges John Arne Riise unfairly and gives away a free kick. Direct free kick taken by David Stockdale. 74:37 Chris Baird gives away a free kick for an unfair challenge on Hatem Ben Arfa. Hatem Ben Arfa takes the direct free kick. 72:13 Shola Ameobi is ruled offside. David Stockdale takes the free kick. 69:42 Jonas Gutierrez takes a shot. Chris Baird gets a block in. Corner taken by Hatem Ben Arfa from the right by-line to the near post, save by David Stockdale. Correction - 68:51 Chris Baird takes a shot from long distance which goes wide right of the goal. 68:51 Chris Baird takes a shot from a long way out which goes wide of the right-hand post. 67:51 Assist on the goal came from Andrew Johnson. 67:51 GOAL - Bobby Zamora:Fulham 4 - 1 Newcastle Bobby Zamora scores a power penalty. Fulham 4-1 Newcastle. 67:30 Booking Tim Krul receives a caution. 66:56 Tim Krul concedes a Penalty for a foul on Andrew Johnson. 65:55 Effort on goal by Fabricio Coloccini from outside the area goes harmlessly over the bar. 64:35 GOAL - Clint Dempsey:Fulham 3 - 1 Newcastle Clint Dempsey finds the net with a goal from inside the area to the bottom left corner of the goal. 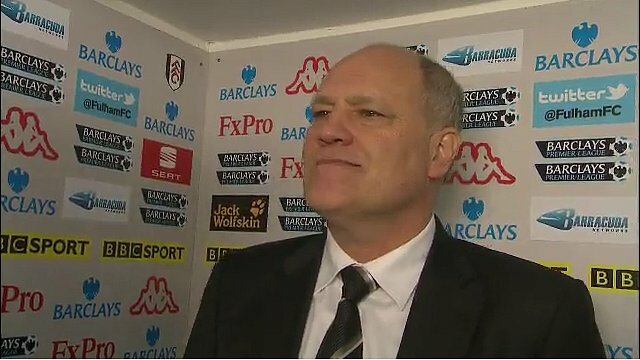 Fulham 3-1 Newcastle. 64:32 Assist by Bobby Zamora. 64:06 Andrew Johnson is flagged offside by the assistant referee. Free kick taken by Davide Santon. 62:17 Danny Murphy takes the direct free kick. Effort on goal by Chris Baird from outside the box goes harmlessly over the bar. 62:17 Booking Danny Simpson is shown a yellow card. 61:41 Booking Caution for Danny Guthrie. 61:23 Clint Dempsey fouled by Danny Guthrie, the ref awards a free kick. 60:44 The referee blows for offside. David Stockdale takes the free kick. 58:38 GOAL - Clint Dempsey:Fulham 2 - 1 Newcastle Clint Dempsey grabs a goal from close in to the bottom left corner of the goal. Fulham 2-1 Newcastle. 58:24 Bobby Zamora takes a shot. Save by Tim Krul. Bobby Zamora provided the assist for the goal. 55:22 Outswinging corner taken from the right by-line by Danny Murphy. Bobby Zamora takes a shot. Save by Tim Krul. Chris Baird takes a shot. Blocked by Fabricio Coloccini. Corner taken by Danny Murphy. 54:10 The ball is delivered by Danny Simpson. 53:19 Long distance effort from Leon Best misses to the left of the goal. 52:40 Shola Ameobi is ruled offside. Philippe Senderos takes the indirect free kick. 51:16 The assist for the goal came from Damien Duff. 51:16 GOAL - Danny Murphy:Fulham 1 - 1 Newcastle Penalty taken right-footed by Danny Murphy and scored. 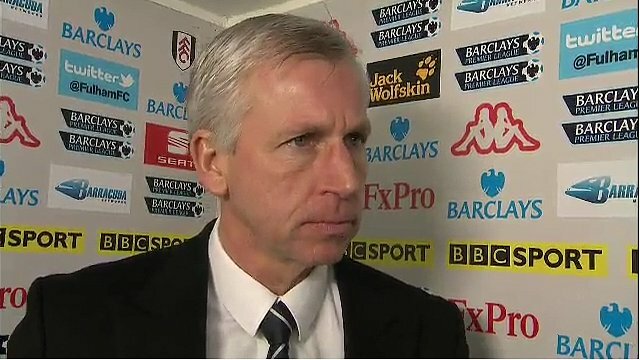 Fulham 1-1 Newcastle. 50:26 Penalty awarded for a foul by Davide Santon on Damien Duff. 49:20 Shola Ameobi is caught offside. Brede Hangeland takes the indirect free kick. 47:22 Shola Ameobi concedes a free kick for a foul on Brede Hangeland. Free kick taken by David Stockdale. 46:28 Damien Duff produces a left-footed shot from just outside the area that goes wide left of the goal. 45:23 Free kick awarded for an unfair challenge on Jonas Gutierrez by Chris Baird. Yohan Cabaye delivers the ball from the free kick right-footed from left wing, Brede Hangeland manages to make a clearance. 45:01 Substitution Chris Baird joins the action as a substitute, replacing Bryan Ruiz. 45:00+1:27 The first half comes to an end. 45:00+0:20 The free kick is delivered right-footed by Danny Murphy from left channel, clearance by Danny Guthrie. 45:00+0:20 Booking Davide Santon is cautioned. 45:00+0:06 Davide Santon concedes a free kick for a foul on Andrew Johnson. 44:55 The ball is swung over by Hatem Ben Arfa, clearance by Danny Murphy. 44:21 Bryan Ruiz gives away a free kick for an unfair challenge on Jonas Gutierrez. Yohan Cabaye takes the direct free kick. 42:04 GOAL - Danny Guthrie:Fulham 0 - 1 Newcastle Danny Guthrie grabs a goal from outside the penalty box to the top right corner of the goal. Fulham 0-1 Newcastle. 42:02 The assist for the goal came from Hatem Ben Arfa. 40:49 Shola Ameobi takes a shot. Save made by David Stockdale. Hatem Ben Arfa takes a inswinging corner from the right by-line to the near post, Brede Hangeland makes a clearance. Hatem Ben Arfa takes the inswinging corner, Bobby Zamora makes a clearance. 37:12 Free kick awarded for a foul by Danny Simpson on John Arne Riise. Danny Murphy restarts play with the free kick. 36:38 Substitution Andrew Johnson comes on in place of Steve Sidwell. Correction - 33:36 A cross is delivered by Mike Williamson, Fabricio Coloccini takes a shot. Save by David Stockdale. 33:36 The ball is sent over by Mike Williamson, Fabricio Coloccini takes a shot. Save made by David Stockdale. 32:43 Short corner taken by Yohan Cabaye from the left by-line. 30:57 Danny Simpson produces a cross. 29:43 Davide Santon produces a cross, Philippe Senderos makes a clearance. Shot by Yohan Cabaye from a long way out goes over the target. 29:05 Bobby Zamora is flagged offside by the assistant referee. Free kick taken by Mike Williamson. 26:41 Corner taken by Yohan Cabaye. 25:28 Steve Sidwell concedes a free kick for a foul on Davide Santon. Direct free kick taken by Tim Krul. 24:21 Damien Duff takes a shot. Save by Tim Krul. 23:23 The assistant referee flags for offside against Shola Ameobi. Danny Murphy takes the indirect free kick. 22:04 Jonas Gutierrez challenges Danny Murphy unfairly and gives away a free kick. Steve Sidwell restarts play with the free kick. The assistant referee flags for offside against Bobby Zamora. Tim Krul takes the indirect free kick. 21:18 Shola Ameobi concedes a free kick for a foul on Steve Sidwell. Danny Murphy takes the free kick. 20:44 Jonas Gutierrez crosses the ball, Shola Ameobi has a header from inside the six-yard box and clears the crossbar. 18:45 The official flags Bobby Zamora offside. Free kick taken by Tim Krul. 17:09 Hatem Ben Arfa takes a shot. Save by David Stockdale. 15:25 Steve Sidwell concedes a free kick for a foul on Danny Guthrie. Free kick taken by Fabricio Coloccini. 12:03 The ball is delivered by Yohan Cabaye, Shola Ameobi takes a shot. Save made by David Stockdale. 11:34 Inswinging corner taken right-footed by Yohan Cabaye from the left by-line, clearance made by Brede Hangeland. 11:02 The assistant referee signals for offside against Damien Duff. Free kick taken by Tim Krul. 9:21 Free kick awarded for an unfair challenge on Hatem Ben Arfa by John Arne Riise. Free kick taken by Tim Krul. 6:59 Hatem Ben Arfa challenges Brede Hangeland unfairly and gives away a free kick. Direct free kick taken by Brede Hangeland. 4:37 Free kick awarded for an unfair challenge on Philippe Senderos by Jonas Gutierrez. Danny Murphy takes the free kick. 3:10 Leon Best fouled by Steve Sidwell, the ref awards a free kick. Free kick taken by Davide Santon. 1:59 Brede Hangeland is penalised for a handball. Free kick taken by Fabricio Coloccini. 0:48 Yohan Cabaye takes a shot. Save by David Stockdale. The official flags Bobby Zamora offside. Free kick taken by Danny Simpson.